With November comes the season of pausing to give thanks. What better way for a Girl Scout to show her appreciation and to acknowledge those who have given outstanding service to Girl Scouting than the Thanks Badge? The Thanks Badge has been in existence since the very first days of Girl Scouting in 1912. The first image of it appeared as an illustration in the 1916 edition of the Girl Scout handbook, How Girls Can Help Their Country. The design of the Thanks Badge has only been changed once in its entire history and even then it was a tiny little change: the triangle in the center of the cloverleaf design was added in 1917. 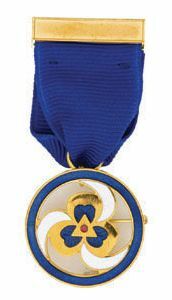 The Thanks Badge was originally designed to be given to those outside of the Girl Scout organization to show thanks and appreciation for their promotion of the Girl Scout way. Its original colors were enameled in white, red, and green. In 1926 a second Thanks Badge was produced, intended for adult Girl Scout members inside the organization. It looked exactly the same, but was enameled in white, red, and blue like the one pictured here. The green version of the badge was discontinued in 1956 when a special Certificate of Appreciation for non-members of the organization took its place. To this day, to be presented with a Girl Scout Thanks Badge is a great honor. To even be considered for it, one has to be nominated, have 4 letters of endorsement written on their behalf, have their nomination submitted to and approved by numerous committees, and finally get approval by the Board of Directors. It is no easy task and is held in the highest esteem by those who receive it. Thanks Badges are so cherished by their recipients that it has even been hard to find one to add to the Girl Scouts of Greater Atlanta Archives Collection! Thanks Badges have been and will continue to be handed down for generations within Girl Scouting families. So, even though you can’t just hand your cherished troop leader or Girl Scout volunteer a Thanks Badge, won’t you take the time to give thanks and show your appreciation and gratitude for her this November? Pause and show her that all she has done for you and your fellow Scouts has not gone unnoticed. Give thanks! Show her you care. Posted on November 3, 2014, in Volunteers and tagged thanks badge, volunteers. Bookmark the permalink. 1 Comment.